Chevrolet at the 2015 Detroit Auto Show unveiled the sixth generation Chevrolet Camaro with the name, Chevrolet Camaro Performance 2016. The new model is faster, compact and sporty in comparison to the previous models and offers better powertrain options. The sculpted exterior, luxurious interior adorned with tech upgrades has an impeccable touch of era. 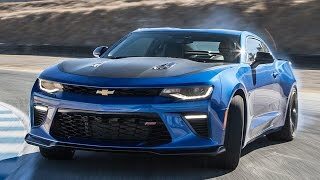 Let us have a look at the review of Chevrolet Camaro Performance 2016 to know this new release better. The interior of Chevrolet Camaro Performance 2016 is driver focused offering high-end control technologies like, Driver Mode Selector, Configurable instrument cluster and customizable ambient lighting that add stars to the interior. Not only this, the interior is also equipped for the first time with the Magnetic Ride Control active suspension. Moving further in the interior segment you’ll notice shifter-focused center console with intuitive controls. A three-spoke flat bottom steering wheel sits proudly in front of the driver hiding behind it a configurable instrument cluster. The air-vents mounted over the dash have control rings around, the unique integration is used for fan speed and temperature adjustments and thus by removing the traditional buttons, company has taken a step ahead towards modernism. There is also an eight-inch screen mounted in center, over the dashboard featuring MyLink system. 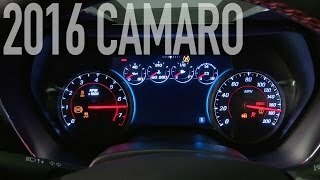 Rounding up the interior details of Chevrolet Camaro Performance 2016 all I would say is, it is a treat or your eyes and a comfortable and luxurious riding experience. The exterior of Chevrolet Camaro Performance 2016 features a sculpted body presenting the muscular effect over the lower and wider body. Starting with the front fascia a cross-car grille or call it headlamp aperture will remind you of the first generation cues. The lighting system includes the projector-beam headlamps and LED daytime running lights. Moving towards the rear fascia the dual-element theme continues and spreads over with the unique rear spoiler and LED tail lamps. 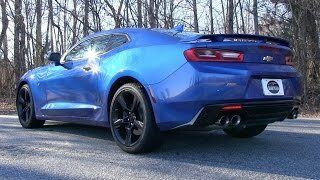 In all the exterior of Chevrolet Camaro Performance 2016 isn’t just about looks and lighting but the aerodynamic capability has been well taken care of, this includes air curtain in front fascia enrooting the fresh air to wheels rather than letting it go to wheelhouses. There is also an integrated brake cooling system accompanied with functional air vents. Thus each and every part has been designed not only to look good but also to add to performance. Beneath the hoof of Chevrolet Camaro Performance 2016 are three engine options. The list begins with a 2.0 Liter Turbo cranking total output of 275 hp and peak torque of 400 nm. The second one in list is a 3.6 Liter V6 for Camaro LT generating total output of 335 hp and peak torque of 385 nm. 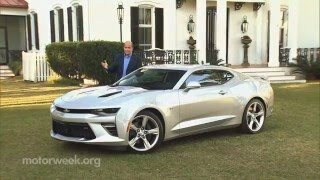 Talking about the last one in the segment we have a 6.2 liter LT1 V8 engine producing total output of 455 hp and peak torque of 617 nm, housed in the Camaro SS and thus making the model, the most powerful model introduced ever. All of these engines come paired to either six-speed manual transmission or the newly designed eight-speed automatic transmission. 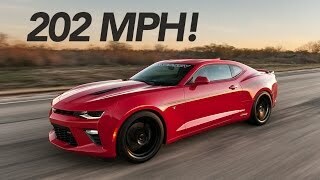 The 0-62 mph sprint of Chevrolet Camaro Performance 2016 thus can be knocked in 5.4 seconds, 5.1 seconds and 4.0 seconds respectively.